ranging from lessons to tournament and league play. ****Normal Fees apply for all specialized Health & Fitness programs & services. Q. What kind of Membership do I need to play Tennis? Tennis-affiliated memberships are listed at far right. Q. What is Occasional Court Time? A. Occasional Court Time (OCT) is defined as random play during normal Club hours. Courts may be reserved up to 7 days in advance of play. Rates range from $24-28 per hour. Q. What is Permanent Court Time? Q. What types of leagues do you offer? 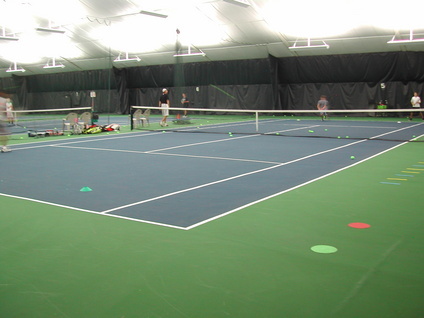 A. Singles and doubles leagues are offered mornings and evenings during the week. Contact Rick Sertz for more information. Q. What if I need some instruction to get started? Q. How can I get my children involved? for students 4-18 years of age. Classes are offered during the week as well as weekends during the school year. Q. What about tournament competition? A. 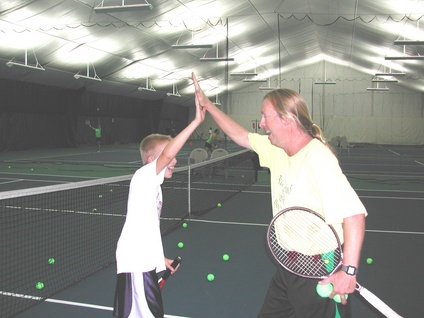 Tournaments and special events are offered over 20 weekends from September through May for players of all ages and abilities.